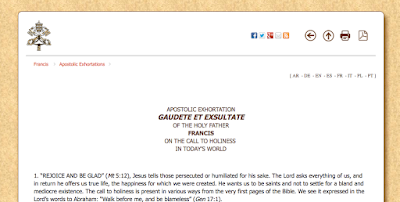 Pope Shows the Way to Modernity in "Call to Holiness"
Pope Francis published a remarkable document today, called the "Gaudete et exsultate", an exhortation to holiness. 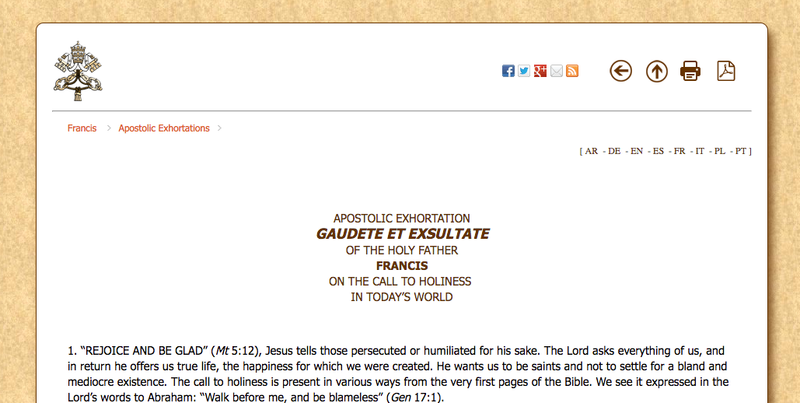 He says its goal is to "repropose the call to holiness in a practical way for our own time". The philosophy of the document is bold and modern. Each of its 177 numbered paragraphs, in five named chapters, contains an expression of wisdom and a practical view on what it is to live a holy life. It is very much worth reading and meditating upon, whatever your faith. ...Our defence of the innocent unborn, for example, needs to be clear, firm and passionate, for at stake is the dignity of a human life, which is always sacred and demands love for each person, regardless of his or her stage of development. Equally sacred, however, are the lives of the poor, those already born, the destitute, the abandoned and the underprivileged, the vulnerable infirm and elderly exposed to covert euthanasia, the victims of human trafficking, new forms of slavery, and every form of rejection. We cannot uphold an ideal of holiness that would ignore injustice in a world where some revel, spend with abandon and live only for the latest consumer goods, even as others look on from afar, living their entire lives in abject poverty. It is also refreshingly modern in its form and format. It is published in HTML, with a clear and consistent structure (numbered paragraphs, chapters). Its references all have hyperlinks to the footnotes, and the footnotes themselves are hyperlinked to original sources! At the top of the document is a list of social media links (FB, Twitter, Google +, email...), as well as a link to print and pdf for old-school applications. It also has been translated into many languages and has links to those versions at the top. It even has breadcrumbs placing this document in context of the other documents on the website. If the Vatican is interested in taking this additional step, I would be very happy to consult on how to convert this and other papal declarations into fully standardized Akoma Ntoso.